Indiana Scale Company located in Terre Haute, IN has been building floor scales for many years. In fact, they are arguably the inventors of the "floor scale package" that everybody now offers. Inscale is an American and Veteran owned company that has been in business since 1990. The company has been owned and operated by the same family. The company has a combined 100 years experience in the scale industry. One thing that is a little different about Inscale is the company concentrates on the building of Domestic, Industrial floor scale units. They specialize in the building of industrial scales and accessories. 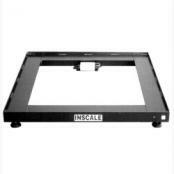 Whereas other companies often delve into different types of electronics, smaller scales, software, etc... Inscale feels they have perfected the art of the scale base. They do offer a few Incell parts and components but their main goal is welding and constructing platform scales. 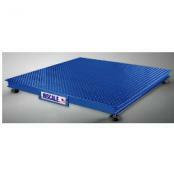 Inscale Low Profile Floor ScaleInscale Low Profile Floor Scales are built in Terre Haute, Indiana. All bases 30”x30” and under, utilize 2” channel understructure, 36”x36” bases utilize 6” channel understructure, and anything else utilizes 7” channel understructure. Bases are quoted with ¼” thick tread plate up to 96” in size, anything over is in 3/8” tread plate. Inscale Heavy Duty All-Weather Floor ScaleIndustrial Floor Scale, All-weather heavy duty scale popular with landscapers, recyclers, and anyone that needs a scale base outside part time or washing down quickly. Domestic Painted Mild-Steel NTEP base, with upgraded load cells, junction box, and feet to stainless steel. Inscale Weigh Frame Tanks & Vessel ScaleInscale Weigh Frame platform scale is for tanks & vessels with bottom piping and applications too heavy for weigh rails. 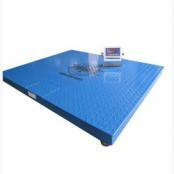 Inscale LP7620 Floor Scale PackageInscale practically invented the concept of the industrial floor scale package. 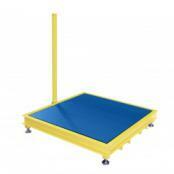 The latest offering is the LP7620 series floor scales. These are painted steel or stainless steel floor scales calibrated to a digital weighing indicator. Various sizes and capacities available. 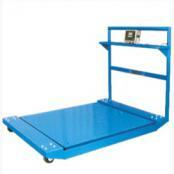 When you utilize Inscale weighing equipment, they have the expertise to walk you through most any problem within a few minutes time, and you can understand what they are saying. Standardized replacement parts for bases are typically stocked and the factory does not use proprietary parts that are expensive or have long lead times from China. Inscale is one of the very few, true domestic scale companies that will custom build to your application and they typically have the best lead times on product production. Whether you need stainless, aluminum, mild steel, a custom size.